Last week I visited the National Hispanic Cultural Center in Albuquerque, New Mexico and stopped at its souvenir shop. In the middle of a collection of books for sale in Spanish and/or English about the history, culture, language and society of “New Spain” that I had expected to find in this country’s premier Hispanic Cultural Center was a selection of books on Judaism and the crypto-Jews. I’m unsure why books on Judaism were included because as I understand it few American Jews came from Spain and the Hispanic community’s dominant religion – indeed only religion for centuries after the Inquisition – was Roman Catholicism. Yet crypto-Judaism is another matter and crypto-Judaism among Hispanics in the Southwest is a key to understanding this region’s unique culture, history, society, people and politics. The existence of Sephardic crypto-Judaism has, as well, implications for other parts of the former Spanish and Portuguese empires that ruled much of the “New World” from Cuba to the Philippines from 1492 to 1898. Meanwhile, crypto-Judaism’s remnants and its hybrid nature are difficult for many of today’s Jews and Christians to comprehend, countenance, let alone embrace. Indeed, far too many are ignorant of its very existence. A few others question the validity of the claims. 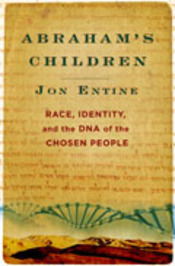 What Jon Entine’s Abraham’s Children: Race, Identity and the DNA of the Chosen People does, among other things, is help provide the genetic underpinnings to support the cultural and other findings about the crypto-Jewish origins of certain Hispanic families who have lived in New Mexico, southern Colorado and Western Texas for generations. This first came to light in the 1980s and has been recorded in earlier works especially in Stanley Hordes’ carefully researched To the End of the Earth (Columbia University, 2005). In addition to Hordes’ work, a few other books on Hispanic crypto-Jews are on the NHCC shop’s shelves. Unfortunately, Entine’s book is not there, but it should be. He, after all, devotes Chapter 8 to their story and also refers to them in other parts of his book. Entine himself is a journalist and documentary film producer. He began to explore the importance of minute DNA differences among populations several years ago – not long after they became known in the scientific literature. I have utmost respect for writers who can turn scientific language into English: Entine does it well. Abraham’s Children – although a questionable title for a book which deserves to attract readers beyond the Jewish community – raises important issues about the uses and potential misuses of DNA testing. The human genome research upon which DNA tests are based is, after all, still in its infancy. The genetic roots that Entine carefully describes are limited to male descendants of males and female descendants of females. Yet, what he has been able to show - based on this still incomplete scientific picture - is a clear genetic link between several of New Mexico’s crypto-Jewish families including that of Father William Sanchez, a Roman Catholic priest in Albuquerque, and the ancient Jewish priestly tribe – or Kohanim that perhaps dates back to 2,500 BCE. Genetic testing is loaded because of its potential for horrific misuse as exemplified in 20th century Europe under the Nazis and its racist connotations elsewhere. Yet it has its positive side as well. Entine explores both thoroughly. He lands heavily on the side of continued genetic research and use of such testing particularly for medical reasons. This should come as no surprise given his family’s tragedy in dealing with what is now known to be a genetically-based disease most commonly, although not exclusively, associated with Jews and traceable to a centuries’ old mutation in a single common Jewish ancestor. As Entine points out, genetic research of relatively isolated populations – like Jews, Icelanders and I also understand Finns – is, if nothing more, crucial to 21st century medicine and the development of new approaches to, and hopefully cures for, genetically based or influenced diseases. As a result of recent scientific studies, specific genetic markers for several debilitating and life-threatening diseases have been found far more among Jews than the US population as a whole. Entine explains how this happened. Although some of these diseases have no known cures or antidotes to date, they can sometimes be controlled or treated preventatively - if discovered before onset. DNA testing offers that key. When I began Entine’s book, I was unsure where it would take me. His American Enterprise Institute affiliation set off mental flashing red lights because the institute plays host to many political neoconservatives. I also recognize, however, that not every AEI associate fits this category or every work part and parcel of the neocon agenda for remaking the world. I’m not sure where the AEI stands on a number of the issues Entine addresses, but it is obvious to me that Entine’s work should be anathema to the Christians who believe in the literal interpretation of the Bible and reject Darwinism and to the Jews, AIPAC and rightwing Israeli politicians who support the ever expanding encroachment of ultra-orthodox Jewish settlements on Palestinian land willy-nilly. This came clear to me in its latter chapters. As I read several reviews of and comments about the book, however, I found - to my surprise - neither controversial topic raised. “The epic story of the founding peoples of Judaism and Christianity,” is in Entine’s words the focus of Abraham’s Children as he told David Green of Haaretz in an interview in November 2007. But the story Entine tells - drawing upon genetic research to support his conclusions - differs sharply from the literal interpretation of the Bible that underpins the Christian Evangelicals and Fundamentalists. Abraham’s Children is, as others have also noted, an ambitious project. It has an amazingly broad sweep – but it hangs together well. Yet, its breadth and lack of footnotes (major references are cited in the text as in a news article and included in the lengthy end notes) makes it easy to cherry-pick. Critiques, however, of lack of documentation are simply off-base. It is also simple to point to a factual error here or there (e.g. the Finns and Icelanders not the rest of the Nordics or Scandinavians as Entine calls them) have been relatively isolated populations with their own distinctive genetic markers) or a seeming inconsistency. But overall this is a readable, serious book that pulls together well disparate pieces of information into a coherent whole. What has made this book most controversial is Entine’s discussion of Jews and high performance on standardized intelligence tests, studies that have shown Ashkenazi Jews score higher-than-average on IQ tests. This is where one apparent inconsistency in his argument lies, e.g. in one chapter he refers to the intellectual achievements of early Sephardim as opposed to other European Jews yet in the chapter on intelligence he focuses exclusively on the brilliance and success of the Ashkenazis, or Jews principally from Eastern Europe. Which is it? What happened and why the shift? Entine cites studies that question whether the same genetic mutations that have caused certain neurological disorders, brain diseases and cancer have also resulted in this higher than average intelligence - so his argument regarding genes and intelligence does not come from nowhere. But what do those tests really measure? Personally I would not rely on standardized IQ tests as a measure of much of anything except an individual’s ability to manipulate three dimensional figures in two dimensional space, understand words used in urban environments and by the ancient Greeks and Romans and, oh, yes, perform well on multiple-guess exams. Entine’s other examples – the large percentage of Jewish Nobel Prize winners in comparison with the small size of the population and the "over" representation of Jews among American professionals - is far more persuasive. But even so, one can argue that an individual’s upbringing and environment may well be the decisive factor here not a genetic mutation that also produces breast cancer or Krohn’s disease. Educators have long known, for instance, that high school grades – not test scores – are the single most important predictor of college success. Entine also points out that certain other genetic markers related to some Jews are far closer to those of their Palestinian and other Arab neighbors than northern Europeans. I would have liked to see him explore this finding further. Perhaps these more general “Semitic” genetic markers or marker could, after all, reveal much more about ethnic and religious origins of non-Kohanim descendants of the Hispanic diaspora - some who also report crypto-Jewish practices in their families. This diaspora, after all, coincided with the onset of the Spanish Inquisition which targeted Semites: both Muslims and Jews. In sum, however, this is a fascinating, readable book that explores topics at the heart of debate in the US and elsewhere at the beginning of the 21st century. Jon Entine: Abraham's Children: Race, Identity and the DNA of the Chosen People, New York and Boston: Grand Central Publishing, 2007.